It looks as though Destiny 2’s Iron Banner and Faction Rallies will be getting special emotes and armor ornaments in the near future. Sharp-eyed redditor Blastingdummy spotted the potential additions in Destiny DB, which scours Destiny’s API for items. Each faction has a unique emote, and there’s an exotic emote for Iron Banner as well. Some Exotic Catalysts seem to be tied to faction allegiance as well. For Sunshot, you’ll have to be pledged to Future War Cult, New Monarchy is tied to Sweet Business, and Dead Orbit is associated with the Gravitron Lance. Should these changes make it into the game, faction affiliation will also grant access to exotic helmet ornaments. For Future War Cult members it’s the Hunter Knucklehead Radar’s Predestination ornament, New Monarchy can grant Titans the Blazing Hearth ornament (no icon so far) for Crest of Alpha Lupi, and Dead Orbit will allow you to pick up the Gaze Beyond Worlds for the Warlock’s Eye of Another World. 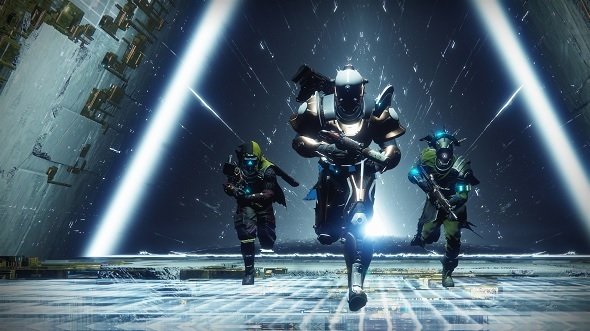 If implemented, these items will give players some new incentives to engage in Faction Rallies and Iron Banner – although we’ll have to wait and see how these items will be awarded. Tying Exotic catalysts to each faction will certainly be a powerful reason to sign up. Blastingdummy also found an Iron Banner-related bundle of items, which includes Lupus Visage ornament for the Fighting Lion exotic grenade launcher, two gleaming crucible boons, and a fireteam medallion. It’s possible this bundle will be offered through Eververse, but it’s far from certain that’s going to be the case. In fact, any or all of these items could be abandoned rather than implemented. A datamine from the first Destiny seemed to indicate that Eververse would be selling consumables for the King’s Fall raid, which led to a lot of player indignation. Bungie’s DeeJ explained in a subsequent weekly update that the files were leftovers from early concepts for Xûr items that were eventually cut from the game.